Lately I've found myself taking on way too many things. This usually leads to feelings of regret, specifically because I'm not doing any of them as well as I could if I'd only been more singularly focused. Because of this, and a few other reasons, namely Matt's and my two-year anniversary, we are skipping town, going off the grid, and heading to Desert Hot Springs. We cannot wait. No TV, no emails, and no phone. Just desert, hot springs, books, food and one movie we are probably the last people in the world not to have seen yet and are undoubtedly committing multiple cinema crimes given that we'll have to watch it on a laptop. I think it worked. Not having recently tried the real thing, it's pretty hard to say, but our makeshift mixture tasted umami-ish with heat. Luckily with food, when you take on too many things, it's still usually edible. So yes, I slightly overcooked the steak and the kimchee was excruciatingly hot. However, the egg was perfectly runny and the asparagus nice and al dente, and all in all, I loved this meal. Even more so, I loved the eggs and rice I made the following day with the leftover rice and sesame salt. As for Matt and me and the desert? We leave tomorrow morning. Now let's see if I can finish some of the things I've started--like maybe all of these half-read books I loved the beginning of so much? 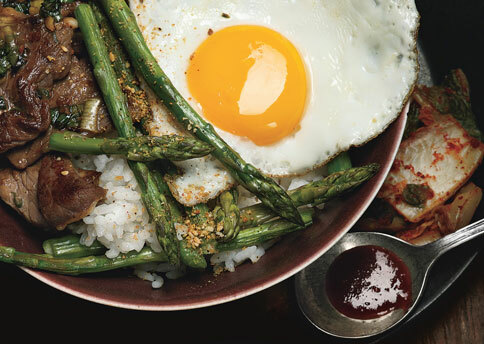 For bibimbap recipe, click HERE. It's 1:15 a.m. Has anyone seen the Mugi Miso? Don't fret...you're not the only ones to have not seen 'that movie' yet. To be honest...my wife and I will probably be the last ones on earth to not see it...until the end of time. Does James Cameron keep track of this? Are we going to wake one night to a glowing blue 'man' with tail standing by our bed? Eek. OMG. This looks amazing, I also totally agree with what you said a few posts back, that an egg makes so many dishes better. Also, you should really see Avatar in 3D. Have a great trip! This post made me nostalgic. Looked sooooo good. Have fun in the desert! Take lots of pics for us! ps the mugi miso/vivienne pic somehow looks like one of those hostage pics. like, WE HAVE YOUR MISO..AND THE WEIRD PAINTING TO PROVE IT. I would never have tried to make Bibimbap on my own, but I figure if you can do it, I can do it! I've seen "that movie" twice, and also recieved it as a Mother's Day gift. So if you never see it, I've seen it enough for both of us. thanks, friends. Mugi Miso for everyone! LOVED this recipe (and totally copied you and made a makeshift rice/egg frittata for lunch the next day). turn it up!!! I love this recipe! Yumm. I really really really want to eat this. But I need YOU to make it for me. Please? Also, I have not seen Avatar. And don't really have plans too. Crime?